What does your breakfast routine look like? Mine used to involve measuring some quick cook oatmeal in a bowl, topping it with walnuts, cranberries, chia, maybe even peanut butter, stirring in some boiling water, then eating with milk. I thought I had it made. Quick, easy, healthy: what's not to love? Then I had a baby. Suddenly, adding multiple things into a bowl seems complex - after all, she's usually in one arm, trying to grab everything from my free hand, or she's [not so] patiently waiting for her own bottle breakfast. So we're back to cold cereal? Or those oatmeal packets? Not so! Make ahead meals are my new favorite thing in the kitchen. When C is sleeping or happily playing by herself, I measure + mix, then freeze or bake for future enjoyment. Since breakfast is one of my favorite meals [also the most important! ], this is my current favorite recipe. Filled with fiber and protein, [re]heat up a slice of this baked oatmeal, and you'll be set for the rest of your morning. So long cold cereal and packets! 2. Whisk together eggs, milk, brown sugar, and vanilla. 3. 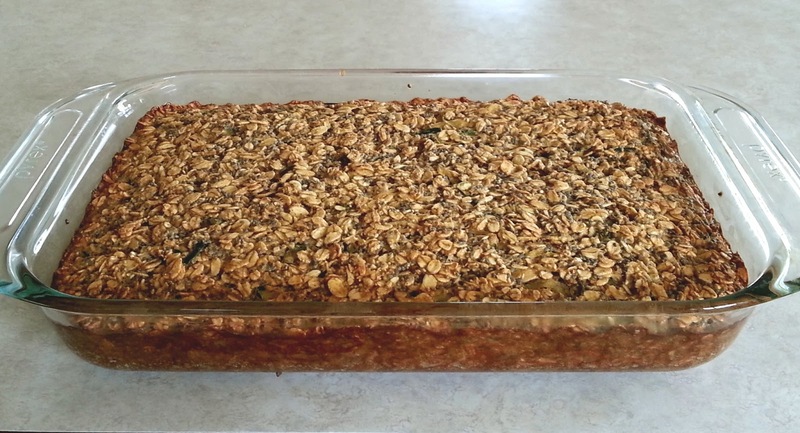 Stir in oatmeal, baking powder, salt, cinnamon, chia, and zucchini. 4. Pour in prepared pan. 6. Cool slightly, cut into 8 rectangles, and enjoy!